Elementary, middle and high school students from Title 1 schools in the Edgewood Independent School District received an early Christmas present thank to the Prairie View A&M University Cooperative Extension Program, the Texas A&M AgriLife Extension Service and Edgewood ISD. Fifty-six pairs of new tennis shoes, donated by AgriLife Extension, Prairie View A&M College of Agriculture and Human Sciences, the Prairie View A&M Cooperative Extension Program 4-H and Youth Development advisory committee, Bexar County Master Gardeners and area 4-H clubs, were distributed to students from throughout the Edgewood ISD the evening of Dec. 19. 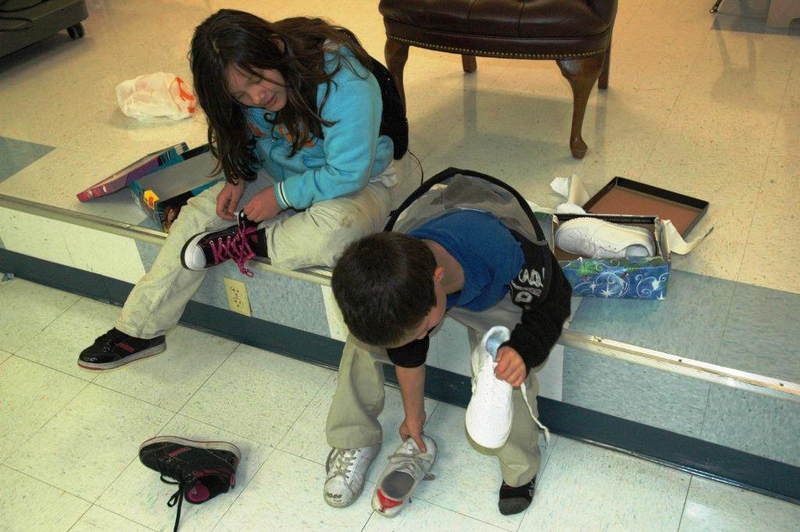 Distribution took place in the cafeteria of Emma Frey Elementary, 900 S. San Eduardo Ave. in San Antonio, where more than 200 students and family members had assembled for the free shoe giveaway. Additionally, many gift cards for purchasing new shoes were donated by Edgewood District Alumni Association and the Compadres for Scholarships program. This entry was posted on Monday, February 17th, 2014 at 7:25 pm and is filed under Uncategorized. You can follow any responses to this entry through the RSS 2.0 feed. You can leave a response, or trackback from your own site.